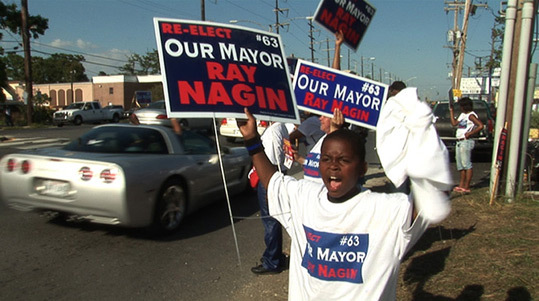 Against the backdrop of a largely displaced citizenry, a devastated landscape, and an increasingly divided community, Race charts the unlikely 2006 New Orleans re-election of incumbent Mayor Ray Nagin from a completely different electorate than had first put him in office. Funded by New Orleans white conservatives, Nagin first ran as the business candidate. Largely unpopular within most of the New Orleans African-American community, Nagin had first been elected to office in 2002 receiving 86% of the white vote and 38% of African-American professional votes, and prior to Hurricane Katrina, he had been expected to win re-election with relative ease. But following the destruction wrought by the failure of the federal levees, it became apparent that New Orleans might have lost its African-American majority for the foreseeable future, Nagin lost his white base, and an unprecedented number of candidates emerged to challenge him, most of whom were white. With the displacement of so many people, Nagin faced the fight of his political life. On May 22, 2006, Nagin won re-election with 83% of the African-American vote, and 21% of the white vote, a near reversal. This very local election garnered the interest of the national media, and Race examines how the final result came to effectively constitute a post-Katrina Civil Rights protest of sorts, but one in which many participants had mixed feelings, and the documentary tells the story of a pivotal political moment of enormous importance to a city in crisis. This CecilFilm Productions documentary is being made in association with the Louisiana Endowment for the Humanities, with generous funding provided by the Andy Warhol Foundation for the Visual Arts, and the Fertel Foundation. All donations are tax deductible through our fiscal sponsor, Video Veracity, a 501©(3) non-profit organization established in 1993 which supports the production and distribution of film and video work by independent media producers in New Orleans and the surrounding region. "Where history, architecture, and performance and festival culture dominate film offerings about local concerns, Race focuses entirely on the smoldering undercurrents of race and class distrust typically papered over in a gauzy haze of nostalgia. I think it's a timely project given the upcoming mayoral campaign of 2010, and an intelligent approach to a complex and under-examined episode in New Orleans history." "This examination of post-Katrina New Orleans politics is a window into the future of America, not the past. This is a tale of race in "post-racial America," and it was occurring simultaneously with the rise of Barack Obama. What happened in post-Katrina New Orleans could happen in any number of American cities." "Nagin drew the line in the sand and reminded black folks that they were the majority and should remain so; thus launching his re-election as the advocate for black folks: an emerging Civil Rights and Black Power symbol. It worked."